It is often said that the revolution that consequently overthrew Ben Ali’s regime in Tunisia in 2011 was one that belonged to younger generations. In fact, the presence of young people in the events that led up to the revolution was extremely important. 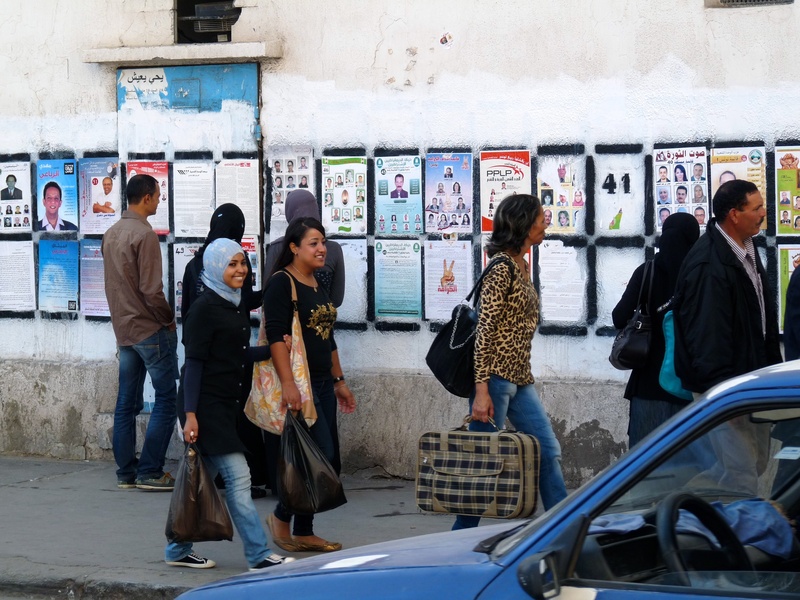 As bloggers, young Tunisians worked on preparing the mindset of a regime change and played a major role in informing the public about the events that were being ignored by the official media, such as the protests in the Gafsa region in 2008. Furthermore, young people played an important role in the demonstrations and sit-ins, notably Kasba 1 and Kasba 2, that led to the resignation of Prime Minister Mohamed Ghannouchi in February 2011. The electoral campaigns ahead of the National Constituent Assembly (NCA) elections in October 2011 and the Presidential and legislative elections in 2014 were also carried out by teams that mostly composed of young people. Figures show however, that the participation of young people in Tunisian politics tends to be underwhelming. During the 2011 elections, only 4.9 per cent of those topping the candidate lists were under 30 (ISIE, 2011). Moreover, less than 20 per cent of people aged 18 - 35 years voted in 2014 parliamentary elections (Observatoire national des Jeunes (ONJ), 2017). The presence of young people in the structures that were established after these elections were also not significant. In fact, the average age of ministers in Habib Essid’s government that was composed in the aftermath of the elections was 56.6 (Sigma, 2015) and less than 7 per cent of the Members of Parliament are under the age of 35 (Marsad, 2017). Young people, in general, do not express much of interest to party politics, as only 2 per cent are active in political parties (ONJ, 2017) and 69 per cent affirm that they do not trust political parties (I WATCH, 2017). This lack of interest from young people to engage in traditional methods of political participation can be explained in a number of ways. The discourses of the various political parties in Tunisia are considered by young people in general as non-convincing, as they don’t give particular attention to the challenges they are facing. Some young people who had the experience of being active in political parties were disappointed and had the feeling of being used for electoral campaigns, especially for door-to-door campaigning and citizen outreach. When it came to leadership positions, they were left out of the selection on the pretext of being too young. The youth sections of political parties are often seen as ghettos for young people, as they don’t play a role in the decision-making process within political parties. It is also noted that there are not many role models that encourage young people to be active in political life since it is still dominated by old politicians. Furthermore, political parties are considered too rigid for young people who find themselves hindered by party discipline and prefer being active in unconventional ways. Finally, the lack of confidence and the skills needed to be active in politics has also prevented some young people participating. It is this precisely this issue that International IDEA strived to address with its Youth Democracy Academy in Tunisia that began in 2016. The academy’s curriculum was created by a team of experts in the Tunisian context and contains 12 modules, covering many aspects of public life (Introduction to democratic principles, Constitutions, Elections, Political Parties, Parliaments, Access to Justice, Local Government, Executive & Public Administration, Engaged citizenry, Civil Society, Working in Democratic Governance, Learning Assessment) and combines technical knowledge with practical skills. Twenty participants aged 18 - 24 successfully graduated from the Academy, which was followed by a six-month internship programme in international organizations, government institutions and local non-governmental organizations. It’s not all bad news for young people in Tunisian politics. Some youth-led civil society organizations are playing an important role in public life, such as Al-Bawsala which monitors parliamentary work and I WATCH, an anti-corruption campaign. Some campaigns that involve many political parties and civil society organization activists and are led by young people were very successful, like the campaign ‘Manich Msameh’ (I am not forgiving) which was carried against the draft law on economic reconciliation. This campaign combined fieldwork (demonstrations, sit-ins) with social media activities and it led to a total modification of this draft law before it was passed by the parliament. Some political parties became more aware of the importance of including young people in their decision-making processes. For example, Ennahdha and Afek Tounes included in their internal regulations provisions, quotas for young people in their executive structures (Shura council and National council respectively). Hamza Amor’s research and work focuses on political parties and parliament, with a special emphasis on women’s political rights in Tunisia.